I love the hustle and bustle of a new year. Everyone seems excited and full of renewed energy, ready to tackle their New Year’s resolutions and make the best of what’s to come! However, with all this excitement comes a bit of stress. Making changes can be stressful- changes in routine, changes in eating habits, maybe even switching gears at the workplace! Yoga is my favorite way to help relieve stress (and if you made any fitness goals- two birds one stone!) and there are quite a few poses that help do just that! 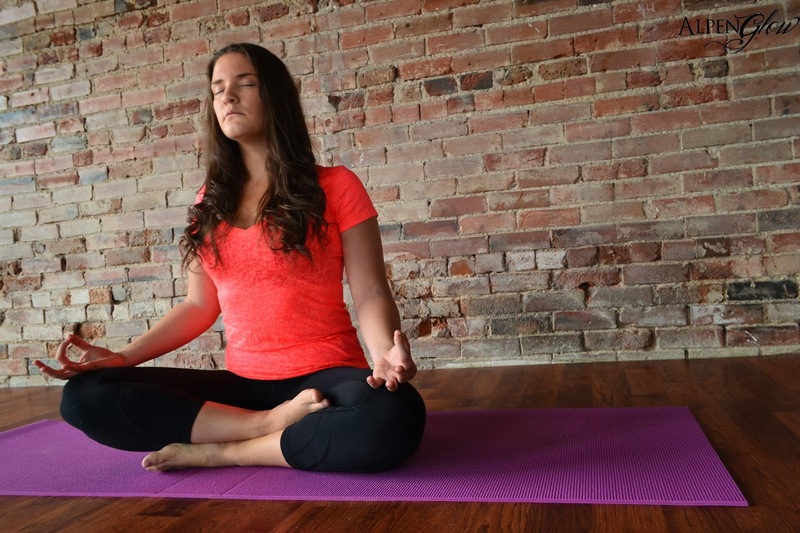 If you’re new to yoga or want a quick refresher on the fundamental poses, make sure to check out my Five Fundamental Yoga Poses post for alignment principles! The poses below are explained as moving from the fundamentals! If I could only tell you one thing about relieving stress, I would use just one word: BREATHE! A bit of meditation, even if it is only a few minutes of sitting still and breathing deeply, can make a world of difference in your stress levels and outlook. We, myself very much so included, often forget to take the time to just be and breathe while trying to keep up with our busy schedules! Start by grounding yourself in Staff pose- if you feel most comfortable on the edge of a folded blanket use one! I like to use my hands to pull the flesh away from my sit bones so I feel more grounded. Cross your shins, pull your legs towards your body and let your knees drift out to the sides, and place your hands on your knees or in your lap. You should be sitting in a comfortable, but tall and engaged seat. Begin to deepen each breath. As your body calms down, focus on breathing into your whole core. Breathe deeply into your belly and expand your chest. Aim for an equal inhale and exhale. Let yourself settle completely! Technically, Cat and Cow are two different poses. However, they are often used together as a simple little vinyasa (flowing pose) to warm up the body and relieve stress and tension. Start on all fours in a ‘tabletop’ position. Make sure that your arms are ‘stacked’ meaning that your shoulders, elbows, and wrists are all in line and perpendicular to your mat (or the floor) and that your knees are placed directly under your hips. From this neutral position inhale deeply and round your spine towards the sky, (aka a scared cat!) as you exhale shine your chest forward, bring your head to look in front of you, and send your sit bones to the ceiling, this will allow your belly to drift towards the floor (cow pose!). Repeat this motion a few times, allowing your body to loosen up. Note: the breathing pattern in this pose can be opposite- i.e. exhale cat, inhale cow. Different teachers teach different breathing patterns, it just depends on where you want to focus (I focus on the back body). 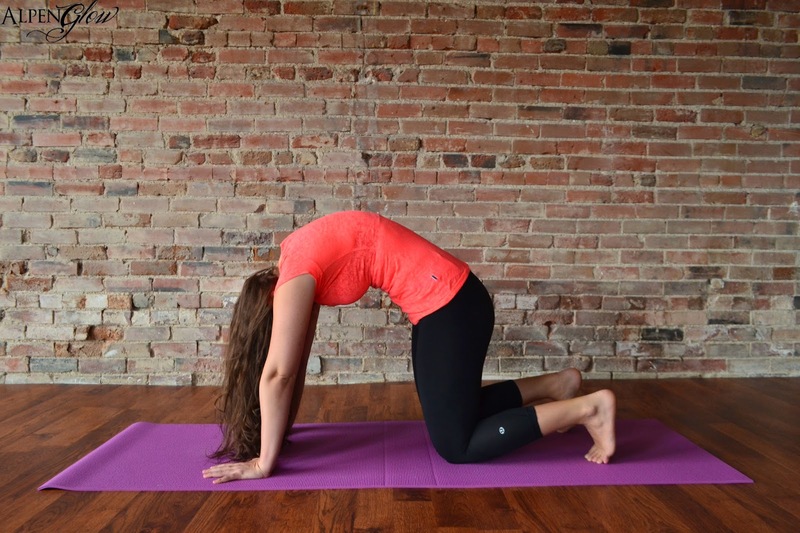 Forward Fold in my opinion is a very underrated asana. 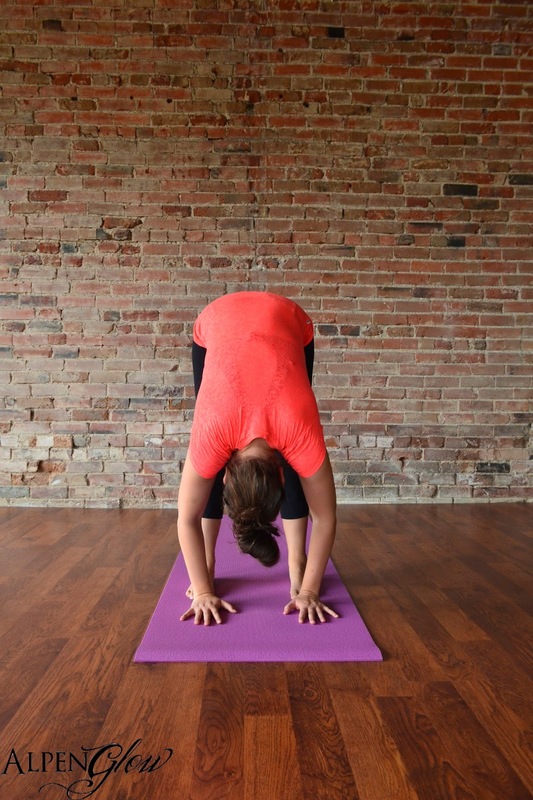 When used as a stand-alone pose, rather than just a transitional one, it can relieve tension in the body, stretch out your hamstrings and torso, and technically is also is an inversion, aka a pose in which your head is below your heart. Start in Mountain pose, and ground your feet to the floor. Inhale and let your body grow long, giving yourself space to breathe, and exhale hinge at the hips. Keep your torso long as you let your hands drift towards the floor. Instead of bending your back aim to keep it long, moving from your hips instead of your waist, creating length and helping to deeply stretch the backs of your legs. If your hands do not touch the floor, I find it quite comfortable to hang in ‘ragdoll’ where you hold opposite elbow with opposite hand. Remember to breathe deeply. Stay in this pose for 30 seconds to a minute, then hinge back to standing, once again moving from your hips. When most people think of bridge pose, they either view it as an ab workout or a set up for full wheel. 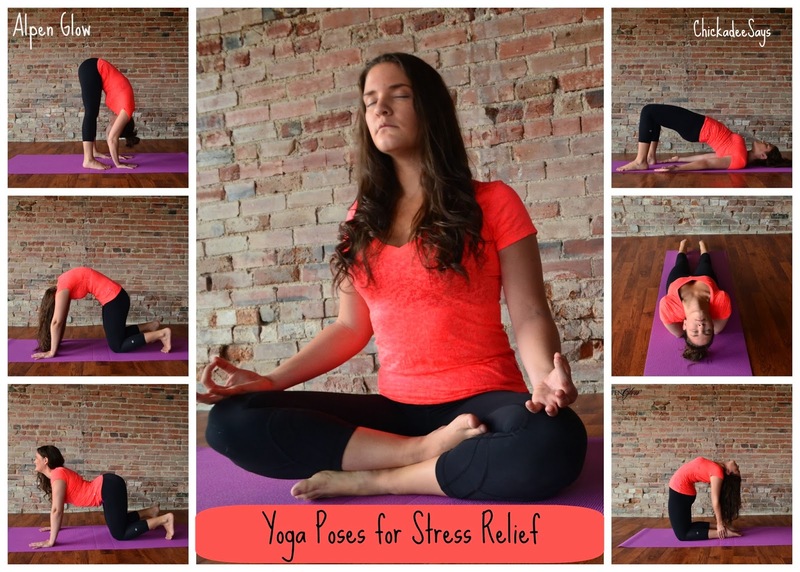 What people often forget is that it works as a wonderful stress-relieving pose as well! I love that this is a pose that is achievable just about anywhere and in almost any clothing for a quick pick me up! Start in Staff pose and lower your torso to the ground so that you are supine with your arms beside you. Bend your knees and place your feet flat on the floor so that your feet are stacked underneath your knees. 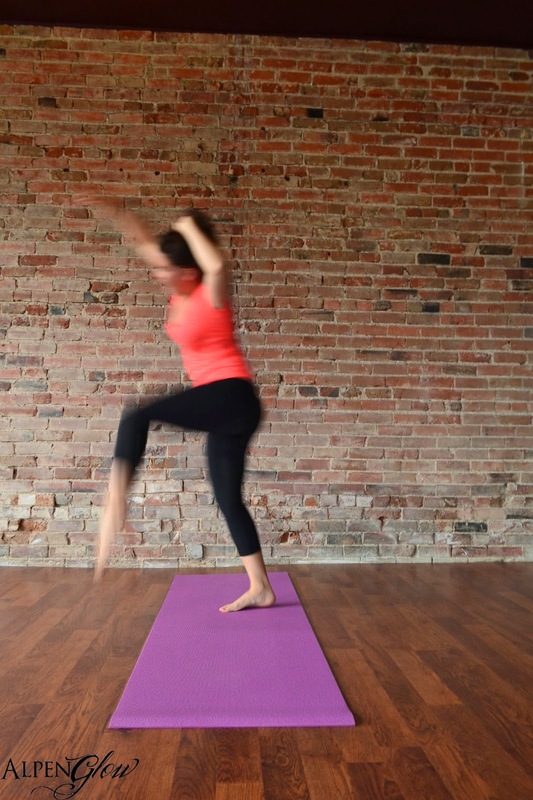 Pressing your feet, legs, and arms energetically to the floor, begin to lift your buttocks off of the floor. Continue to lift until your buttocks and thighs are just about parallel to the floor, so that your body forms a straight line. Make sure that you keep your feet, knees, and thighs parallel to each other, keeping them from drifting apart. If it is accessible, clasp your hands behind your back so that you can focus on your shoulders grounding to the floor. Lift your chin away from your chest, and breathe deeply, allowing your chest to lift away from the floor. Carefully lower back down to the ground, starting with your chest, buttocks, then knees. I have always thought that fish pose was a bit weird. It involves sitting on your hands and having just your back do strange things. But oddness aside, it does offer a wonderful release of stress and anxiety. Start in Staff pose and lower your torso to the ground so that you are supine with your arms beside you. Slightly bend your knees with your feet firmly on the floor, so that you can lift your pelvis to scoot your hands- palm sides down- underneath your buttocks. Let your pelvis lower onto your hands, and keep your elbows and arms tight to the sides of your torso. Depending on how long your torso is and the length of your arms, different hand placement is key to this pose being comfortable. Long arms, short torso? Let your hands rest below your buttocks. Long torso? They can be beneath the upper part of your buttocks. Find what is comfortable for you. Keeping your hands where they are and arms pressing into the ground, inhale and lift your head and chest off of the floor. Allow just your head to drift back towards the floor, taking care to notice any discomfort in your neck. If there is any neck discomfort, you can lower your torso nearer to the ground and try again. You can keep your knees bent, or straighten your legs and engage all of your leg muscles, down into your feet. Breathe, then slowly release towards the floor. 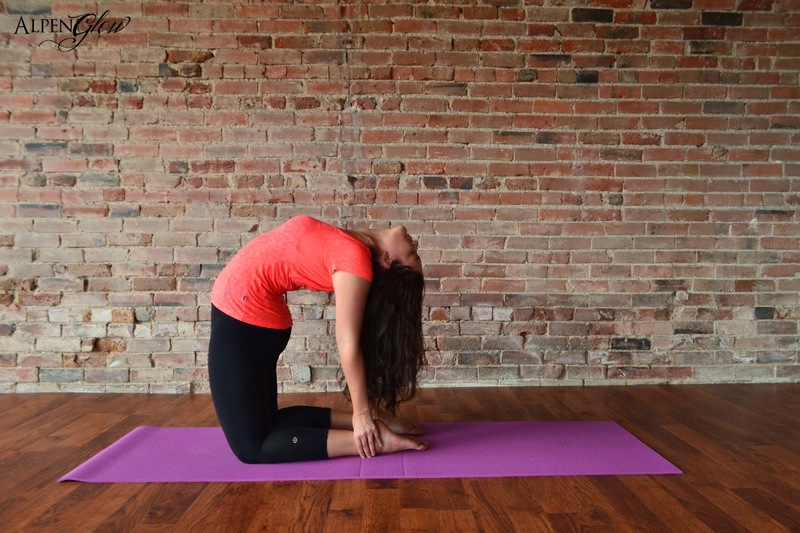 Camel pose is quite advanced, so make sure that you are fully warmed up (especially your back, groin, and shoulders) before attempting this back extension! One of my favorite things about Camel is that there are so many different variations that build on from one variation to the next! As you shine your heart forward and let you throat open, Camel provides a stress and anxiety release! Start kneeling on your mat, knees just about hip distance apart, with your thighs perpendicular to the floor, and your feet either flat on the floor (I prefer this, but it is personal preference) or with your toes tucked under. Press your shins, knees, and feet energetically into the floor, creating a stable base that you can pull up and away from. Reach from the crown of your head upward, elongating your spine and breathing length into your torso. Start to shine your heart forward, drawing your shoulders back, letting your collarbones broaden, and opening your chest towards the sky. Let your hands hang here, or place them on your lower back and notice how you have already begun your back extension and are in an expression of Camel pose! Make sure to listen to your body, each variation of this pose is equally as beneficial for stress relief! If you feel comfortable and stable in this position, you may deepen your back extension. To deepen the back ‘bend’ here we want to extend the upper back without compressing your lower back. Focus on creating the apex of your ‘bend’ in upper back, instead of bending from the waist. A great way of doing this is to place your hands on your lower back, fingers facing upward and extend outward, over your fingers. Make sure to pay attention to your neck, keeping it engaged and long. As your extension grows deeper, reach your hands towards your heels, making contact if possible. Also, pay attention to your ribs, making sure that they aren’t poking out and that they are engaged and streamlined with your torso! Breathe here, and allow your body to soften while still maintaining strength. When you are ready to come out of the pose, inhale, release your hands from your feet, and rise back to your starting position. As always, when it comes to yoga poses, listen to your body- it is your best teacher! If something feels wrong, or something feels amazing learn from it! Also, one of my favorite things about yoga is that it is called a ‘practice’ for a reason! The poses need to have a foundation in alignment principles, but each asana is forever evolving, so perfection isn’t possible! Do you have a favorite way of dealing with stress? Let me know in the comments below! These pictures were taken by my lovely photographer (and yogi) friend Adrienne. Make sure to check out her website ARaeAGlow.com – you might happen to see a familiar face! P.S. Her pictures of ice are INCREDIBLE!